Tube stations across London will display posters aiming to tackle stereotypes about children's disfigurement. 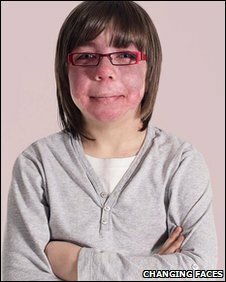 London Underground (LU) has donated 430 advertising spaces to promote a new campaign for leading disfigurement charity - Changing Faces. The posters will feature children with different types disfigurements. Changing Faces helps people deal with the psychological and social challenges posed by disfigurement. The charity hopes the images will break down negative assumptions. Winnie Coutinho from Changing Faces, said: "The children in our posters radiate a positive sense of themselves which we hope will encourage people to re-evaluate any limiting assumptions that they might have had about people with disfigurements." LU said the campaign will make people think about how challenging it can be for people with disfigurements on a busy tube system. John Ball, Director of Strategy and Service Development said: "We want to make the Tube a welcoming place for all our customers. "London Underground has already signed up to the Face Equality charter to ensure that people with disfigurements are treated fairly and equally, irrespective of their facial appearance. "Supporting this thought-provoking campaign reflects our commitment to diversity and inclusion." Changing Faces was founded in 1992 by James Partridge OBE, who was injured in a car fire when he was 18-years-old.